As a kid in a wheelchair, going to an amusement park wasn't necessarily my favorite thing. To ride most of the rides, I would have to get picked up out of my wheelchair and carried onto the ride - and even then, most of the rides I could ride were the "kiddie" rides. But going to Disney was different. Disney has gone out of their way to make rides as accessible to riders in wheelchairs, and they make sure there are many, many other things to do during your time at the park that don't require getting out of your wheelchair, either. In each park at Disney World, there are at least a handful of rides that you can drive your wheelchair directly on to - more than at any other park I've been to. They have designated handicapped seating areas at each and every one of their shows and parades, and their resorts have a great variety of accessible rooms in various sizes and price points. Going to Disney is always an amazing experience - but going to Disney as a Make-A-Wish kid is such an unbelievably incredible thing. 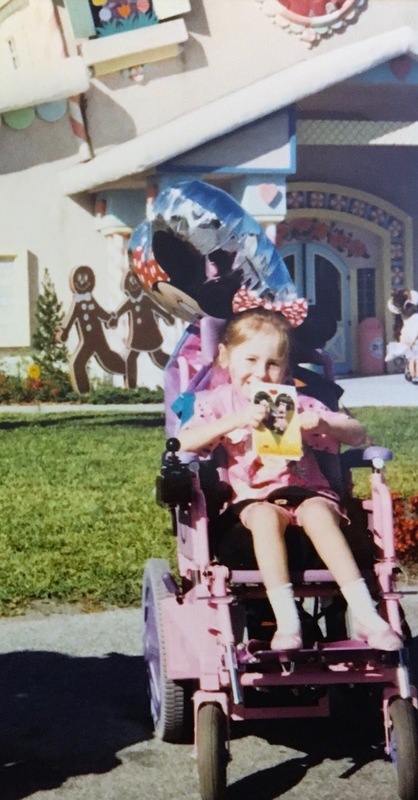 My sister and I were both lucky enough to go to Disney as Make-A-Wish kids, and the memories from those trips - even though they were more than 20 years ago now - are still some of my favorite memories. As Wish Kids at Disney, we got private meet and greets with every character, we got the best seats for the shows and parades, and we didn't have to wait in any lines. We really, truly felt like Princesses! Everyone treated us so, so kindly and generously, and it made us feel so special. When you're a Wish Kid at Disney, you get to stay in your own private "community" called Give Kids the World Village. Every single thing about the Village was accessible - your villa was accessible, you could ride your wheelchair on the carousel, and the swimming pool was adapted, too. It sounds like a small thing, but for Wish Kids and their families, it's huge to know that you don't have to worry at all about the accessibility. At Give Kids the World Village, you can also have breakfast with the characters, and they come around to each and every table to chat for a few minutes. We met Snow White during one of those breakfasts, and had her sign a little Snow White figurine we had bought as a souvenir. Later that day at the Magic Kingdom, we were watching one of the parades, and the float with all the princesses - including Snow White - went by. Snow White saw me and my sister from her spot on the float, pointed directly at us and waved, and then walked from the front of the float to the back and pointed and waved again to make sure that we saw her. This story is still my favorite Disney story to tell, and really sums up the magic of the park. You can't ever reserve this room, so this is incredibly special, and I can speak from personal experience and say that you're donating to a really great cause. Please consider donating here!